Drink more tea: I was never a tea person. Honestly, I was never an any-drink kind of person. For years, I only drank water, milk and occasionally I'd drink a mango and orange juice. This year though, I decided I should 'experiment' with my drinks and bought a few different boxes of tea and have been drinking them and trying to figure out what kinds of tea I like and don't like. Exercise: Okay this is a must-do for me. I've been meaning to get a gym membership for months now but I'm just too lazy to even do that. I decided that I'll start with Blogilates videos and a bit of running at the local park which is a 2-minute walk from my apartment. After I do this for a while, I'll think about a gym membership. Study: I study a lot, I really do, but the thing is I only study two weeks before an exam instead of doing it during the whole semester so I don't have to cram. I need to change this habit ASAP. I'm now trying to save a few hours on Saturdays to go over my class notes, re-write them and organize my things for the week ahead. Watch more TV shows: I'm getting tired of hearing my friends and family talking about a tv show they're watching and I know nothing about it. I used to love watching TV but for a few years now, I only have the TV as background noise. I've got a list of TV shows I want to watch and hopefully, I'll watch them all this year. Cook more: I love cooking. When I was little I would spend hours watching my grandmother cooking and baking and learning new recipes and techniques. Right now, I don't cook as much as I'd like: I probably only cook 2/3 times a week and I'd like to cook more. Also, I'd like to try out new recipes. Finish writing my books: For those who don't know, back in 2014 I started writing my first book on wattpad. Four years later and my books have a total amount of 6.3 million reads. Back in November of 2016 I started publishing my stories on Radish where I started making money out of them. For a few months now, I haven't published new chapters on my two most recent stories and I seriously need to do that. I'm thinking of doing so after I finish writing this blogpost actually. Spend less: I'm failing at this miserably at the moment! I can't help it, I'm always looking for stuff to buy. But I do need to start saving money because I really need a new computer. 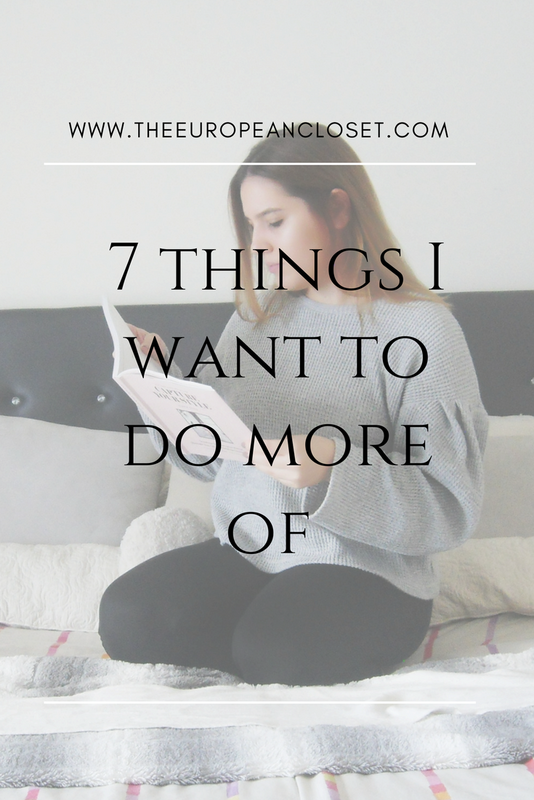 What are the things you want to do more of?